YES!! I am about to add some New fly designs and sizes to the site, I,m sure you will like my Stu's Elk Hair Caddis, that with my use of a foam body floats much better than a standard one- great as indicator flies as well- on Tiemco large gaped strong fly hooks as well!! and smaller NZ Deadly Blow flies. 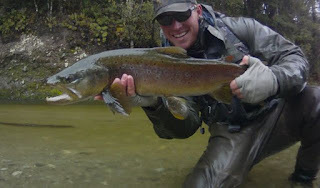 A Trophy Trout! Caught on a Stu,s NZ Deadly Blowfly! Again! This week i should be receiving some more DVD's in so - Check them out as well, Connect dvd is still the best seller at the moment. For nearly two months in Northern Southland we had no rain, we normally get the rain over late Dec or early Jan , but it never came. The ground was as hard as rocks and there was not much grazing for the farm animals. Many rivers had started to dry up , especially the small tributaries, with fish and game rescuing trout stuck in pools on dried up rivers, Everyday people were coming into the shop with stories of dead trout in the small streams. All the major rivers were still holding up like the mataura, but very low up to 80% lower flows than normal. It was not looking good. Derek had a water proof jacket- but turned it into a fly patch!! Then last week the wet stuff came from the heavens and the hard ground struggled to soak up the water. So the rivers all came up dramatically. Some within 4 hrs came up nearly 3 mtrs. They were all chocolate brown . We just made it across- thanxs to the kind NZ farmer! I had a half day guiding on the Friday this happened and as the Main matarua river was coloring up and too dirty to fish, we crossed it to fish another small river. As i was guiding and near the end of the day, the local farmer i know saw me and raced over on his Quad and told me and my client that we better get back across the river asp and use his mobile sheep bridge as the river was raging now and he was about to pull the bridge away as its on wheels before it got swept down stream. This is in a way a bit of a warning to others ,especially no locals , if you are anywhere in NZ fishing, and the river starts to rise make sure you are on the correct side for getting home and do not try and cross a raging river- the owner of the land behind my shop did that and drowned a few years ago and he should have known better!! So be careful. As well as the rain !! yes there was Snow as well- but it has all melted now- NZ weather- be prepared at all times!! WILLOW GRUBS BEFORE THE RAINS!! Just before the rains, the willow grubs were falling just like rain drops and when the heat of the day came,. The Large browns would come to the surface for the feast. The only time we nailed the trout was when i had a client with very good accuracy and dead drift presentation with the imitations , something to remember when targeting willow grub feeders!! 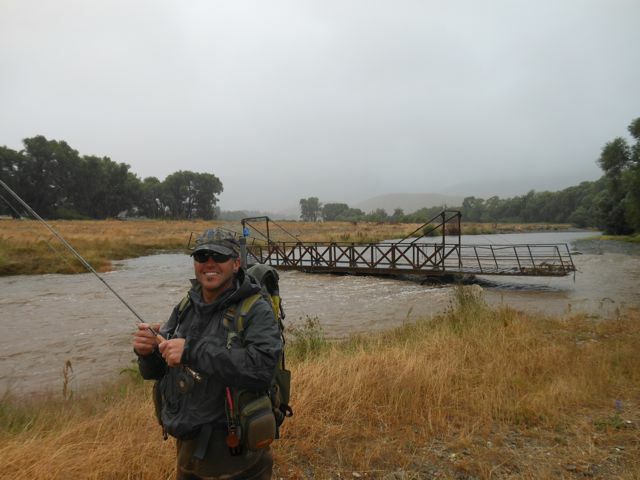 and i also notice unless the fist cast and offering was on the money the game we play was over pretty quickly , with the trout knowing that something was just not right with every other cast! 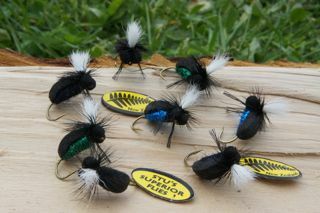 The Fish that were not on Grubs were also coming up for the new smaller size 12 NZ Deadly blowfly that i just added last week to the web shop. 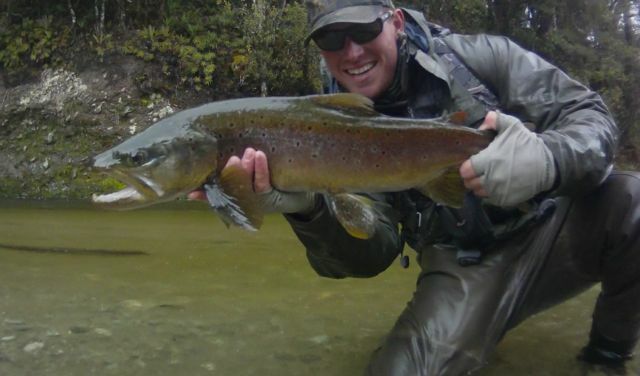 The past few days i have been guiding and the rivers were all clearing in southland and the fish were pretty much on the munch big time. 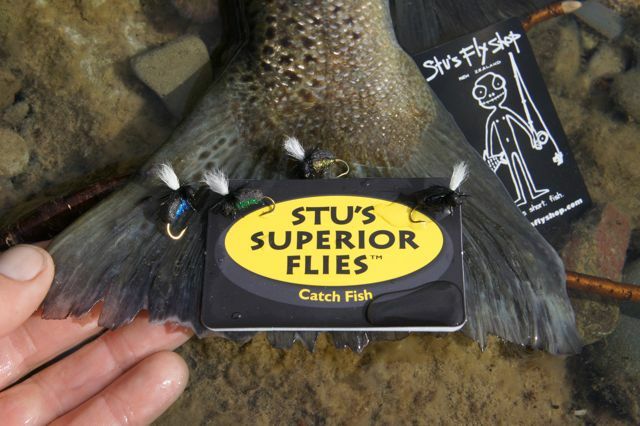 With good numbers of trout taking the flies every day. I tried the good old red worm fly in the slightly dirty clearing water to some trout , but not even a sniff! yet at the start of the season with a fresh - they can work well. That was another interesting learning curve this week. But the fly that was nailing them big time was size 18 King pogo tied off the back of a NZ May Fly bomb with a small yarn indicator above. I tried other small nymphs but this was by far the money fly . The rivers are dropping quickly and today all are gin clear again. So it will deadly blow fly and willow grub time again soon. Dylan- Fishing with a brown Stu's NZ mayfly nymph size 18 in rising water!! Just before the rains in the evening there were thousands of brown beetles hatching on dark and into the night, One farmer on a river further down south was nailing some big trout on my brown beetle , early in the mornings while the trout were still focused on the beetle silhouette as a food source. LEARNING MORE FLY CASTING STUFF! At the moment I have the Casting Guru (FFF MCI- gold medal winner etc)from SWEDEN staying with me , Stefan Gangreenfoot. Who has a infected foot so for a jam sandwich with lots of salt on in has been helping me with stuff. 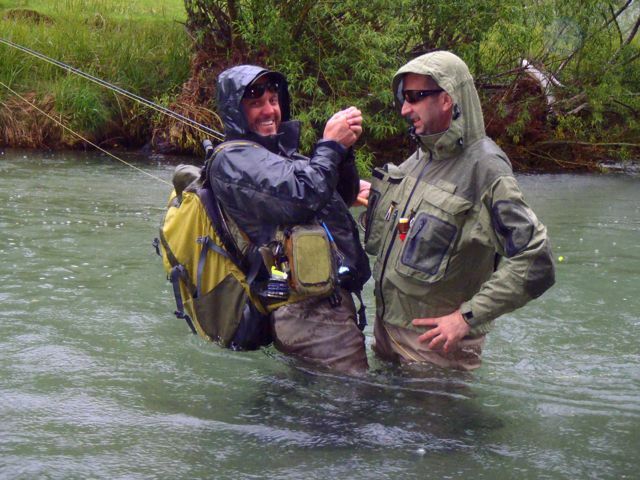 I have also just hired him for a personal fly fishing school- as there is so much to learn ! and i don't know it all. But i will tell you more about what we got up too another time. But apart from working with another Casting teaching nut which has and is awesome- I,m sure he has poisoned my poor pet gold fish - i think he has been washing his feet in the tank!!! 2 dead two to go :(. Catch you all later and please keep SUPPORTING THE SHOP- as this shop is the REAL DEAL !!! and not a big commercial thing! just PASSION!- BUT ! i do need you all to shop with me for it to survive!